Voice lessons with Jeff are fun, informative and challenging. Every voice is unique and there is not a "one size fits all approach" to voice lessons. Each lesson is designed to fit your personal needs as a singer, whether it be range building, smoothing vocal "breaks" or transitions, developing endurance, support, breath management or rehabilitation from previous, less healthy approaches to singing. Overall longterm vocal health is at the forefront of everything we do here at Voice Soaring Studios. Vocal lessons are available in a variety of convenient settings, including online. Explore your options, learn about voice lessons and read testimonials below. Now you can take a virtual voice lesson in the comfort of your home! Jeff teaches students all over the world, including the United States, Europe, Asia, and Australia. Learn to sing directly from your computer, smart phone or tablet with an individualized, one-on-one lesson! Live in North Jersey? Take a voice lesson at the West Orange studio. The space is very comfortable, private and has great acoustics! Being from the south, he likes to make his students feel at home here. Hot tea and beverages are always available. Parking is convenient and plentiful. Jeff also teaches at the beautiful Ripley-Grier Studios in the heart of New York City. This is the #1 rehearsal facility in the world, which includes well maintained and roomy studios. Ripley-Grier Studios is great place to meet other artists or to find out about Broadway auditions. My voice teacher Maestro David L. Jones once said to me “Voices either soar or they don’t.” I loved that and knew immediately that teaching singers the technique that would allow their voice to soar would be my mission in life. Here at Voice Soaring Studios you will learn time-proven concepts and exercises that will truly "Let Your Voice Soar" and last a lifetime! "I have seen the wonderful voice-structuring approach that Jeff Alani Stanfill teaches. He is a vocal instructor with a positive approach sharing a vast knowledge of the Old Swedish/Italian singing school. I would recommend Mr. Stanfill to anyone searching for their complete voice." From the very first lesson with Jeff, we realized that we had found the perfect partner to develop our daughter Cinya’s voice. What impresses us about Jeff firstly is his demeanor. He is gentle with our Cinya. He is genuine in his resolve to develop Cinya’s natural voice. To us this makes sense because for us the goal is to enhance her gift, not to change it. His concern about protecting her voice for longevity through his very careful series of exercises is also comforting and admirable. 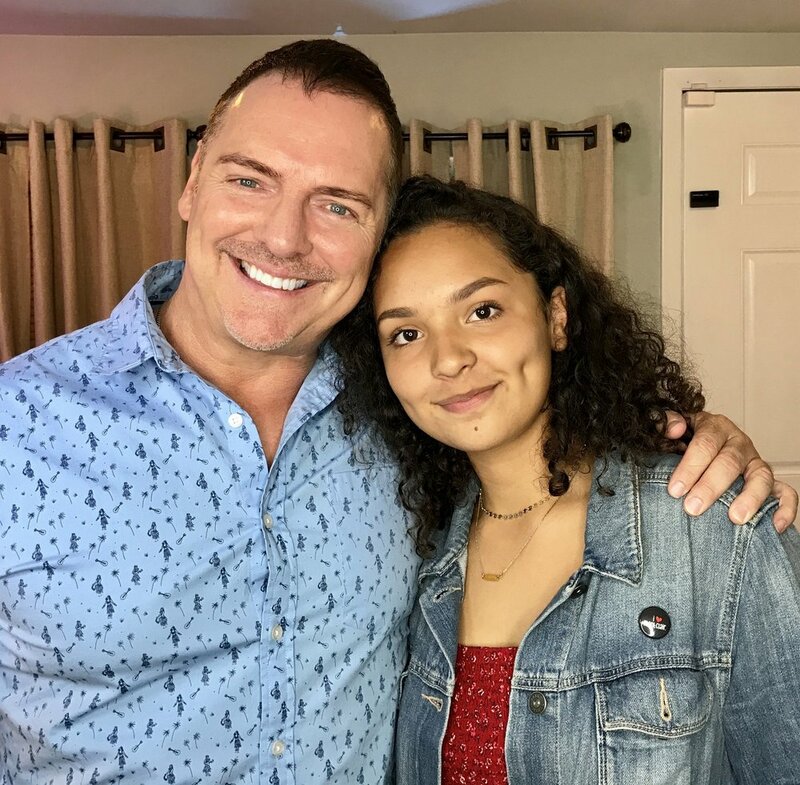 Cinya has been taking voice lessons with Jeff for about 6 months now and the difference in her voice is unbelievable. Her control, range and overall growth in such a short space of time is remarkable. Before I came to Jeff at Voice Soaring Studios, I had a very difficult journey as an operatic tenor and classical singer. But very quickly after starting lessons with Jeff, I felt a sense of hope and couldn’t believe the notes that I was hitting even after only a few lessons. My voice kept getting higher and higher and now I have a solid High C. And it just keeps getting better. My authentic sound is finally coming out. Jeff patiently guides his students with a superb expertise of the voice along with incredible humor and wisdom. This indeed is a rare combination in today’s world. My new year’s resolution in 2011 was to start voice lessons and, a year later, I think it is what I want to do for a career. None of that would have been possible if it wasn’t for the nurturing support, positive encouragement and the incredible teachings of Jeff Stanfill. Every lesson he welcomes you with a smile, a funny story and a upbeat note to start your lesson and continues his wonderful attitude throughout. Jeff challenged me to do things in a year I didn’t think I would be able to do in 3 years, but I was able to do them with ease. His reassurance of my strengths helped me work through my weaknesses. Jeff Stanfill has an astonishing way of helping a vocalist reach his true and natural vocal potential. His technique is exactly what I needed to strengthen my chest voice and develop my head voice. I’ve always had a wide vocal range, but I never knew exactly how far I could stretch it or how to determine my voice type. I can proudly confirm today that I am a Mezzo-Soprano and it’s all thanks to Jeff! He is the kindest, most patient I know and the one who is most committed towards the growth of his students. Working with Jeff over the last three years has helped my head voice reach soaring levels I didn’t even know existed. He not only provides his students with extensive knowledge on proper technique but at the end of your lesson, your voice is free, open and you feel so much more empowered! Jeff is a very gifted vocal coach who knows intuitively what his student is capable of on a profound level and he has the talent to bring that magic out of anyone! Having taken a hiatus from singing and performing for about 15 years, I started back slowly only to be stopped by the perils of a vocal cord paresis caused by a virus which rendered me almost silent for months. After months of speech therapy and finding my way back to singing, I found that my old ways and habits of just singing scales were not useful nor healthy for me. I had to start over! I truly believe I found Jeff by divine intervention, having perused some YouTube instructional videos. I found his videos to be incredibly helpful and the concepts he introduced made absolute sense to me. I then made the call for help! I don’t write testimonials unless I truly believe in something or someone. This man and the concepts he introduced to me based on the Swedish-Italian school of singing have helped me attain a head voice I have NEVER had. My “mixed” voice is stronger and he explains everything so that you understand not just the “how’s” but also the “why’s”. I can now move freely from register to register and my range has increased exponentially! Thanks to him, I now understand the importance of breath in creating and maintaining sound. I am learning how to release the jaw and tongue, two of the biggest culprits that have caused me vocal issues in the past. Jeff is a master diagnostician and as an incredible singer himself he easily understands vocal issues and finds the right tools to address those issues. I can’t say enough about Jeff and not only is he the MOST amazing teacher, he is a spectacular human being, incredibly kind, positive and SO supportive! As a mature singer and singing better and in a more healthy way than ever before, I know I will be singing way into my “golden years”! Never Give Up! Are you thinking of giving it another go? Do yourself a favor and contact Jeff Alani Stanfill…He is a game changer! And I’m back in the game! In 1999, after years of struggling to to find a vocal coach who could help me build a solid, healthy vocal technique, I met and began studying voice with the late voice teacher Leona Mathews. Mathews was a master at teaching breath management and support. In only a short period of study with her, my voice began to soar like never before. No longer did I experience tension in my throat while singing and my breath became the fuel for the sound rather than something that stopped the sound all together. Suddenly the voice had more power and resonance than ever before. Fellow singers noticed the difference in my voice right away and began asking for tips to help their voice as well. In my last lesson with Leona before her unexpected passing she said to me "Jeff, you are going to be a voice teacher, and I want you to carry these ideas into the future for singers to learn and master". After her passing I began sharing the ideas with any singer who would listen and each would have a similar experience as I. The next step would be to find a teacher who taught similar ideas of breath management and support. Soon after Mathew's passing, I was blessed to hear about another voice teacher, Maestro David L. Jones, who would not only carry on the work that Leona started, but would fundamentally change my entire approach to singing by teaching me the concepts of the Swedish Italian vocal technique. The Swedish Italian vocal technique is designed to balance the voice from top to bottom with no obvious breaks. The voice becomes fuller, richer, flexible, more powerful and certainly more beautiful with regular application of the concepts and exercises of the technique. Voice Lessons will focus on five major areas of study: register balance, breathing, range building, body posture, and repertory. During your lesson you will learn exercises designed to balance the registers of chest, middle and head voice. Often, singers have over-developed one register of their voice which can leave the other registers feeling weak and disconnected. Balancing the registers is very much like taking your car in for a re-alignment of the wheels. Suddenly, it drives more smoothly and doesn't veer off to one side. Once the registers of the voice begin to align, the singer can then begin to work towards more power and resonance. Often, I hear from new singers "I just don't understand how to breathe for singing". Breathing is fundamental to balancing the voice, and in each lesson, you will learn dynamic concepts of breath management designed to make singing feel like you are simply breathing notes set to music! Range building is another important area of focus. Through fun and challenging exercises, you will easily gain several notes on the top and bottom of your voice. Singers must have full "range of motion" in their voice in order to maintain optimum vocal health. Body work is an integral part of vocal technique. In each lesson you will learn concepts rooted in Yoga, Alexander technique, Feldenkrais and Breathing Coordination which will allow your voice to grow as never before. A free, strong, supple body is key to a free, strong, supple voice! Once the voice is running smoothly and efficiently, repertory work will follow. We will focus on one or two songs of your choice. You will need to bring two copies of the song/s with clearly printed chord progressions above each line of music, as this makes sight reading easier for accompaniment. Jeff will accompany most songs on the piano. However, if a piece has an extremely challenging piano transcription, you may be asked to provide an accompaniment track for the lesson. You may bring this on your phone or tablet to be played through the studio sound system. If you are taking voice lessons online, please have a backing track available as Internet lag time can often hinder piano accompaniment. Many students want to know how to apply the vocal exercises to song repertory. During the lesson we will break down songs on which you are working into phrases. I will show you how to apply certain vocal exercise to any given phrase, in any type of music. Once all the notes and rhythms are securely in place, squarely in the center of the pitches with good intonation, we will work on stylistic choices that will give the song your individual stamp and make it yours! Singers are encouraged to record their lessons. We provide two options for recording including a Roland CD recorder and and a Zoom H5 digital recorder. For the Roland you will need to bring a blank recordable CD, and for the Zoom, a 2gig to 32gig SD card. You may also record the lesson on your phone, but as the lesson is one hour in length, you will need to ensure you have plenty of free space on your device. Filming of lessons is allowed as long as the camera is only pointed to you. I do not give permission to have filmed lessons uploaded to social media sites such as YouTube, Instagram, FaceBook or Twitter. Video recordings of lessons are for the express purpose of self study. There is an old saying that adequately addresses the issue of practicing. “How will you get to Carnegie Hall? Practice, Practice, Practice.” Today’s hectic society does not make it easy for a person to find the time to practice. However, singers need to practice regularly in order to develop the muscle memory needed to solidify the technique. If you want a fabulous body, you need to work out regularly, watch your diet, get plenty of rest, drink lots of water, and avoid alcohol, cigarettes, and drugs. The same rule applies to your voice. It needs time to exercise. A little practice every day is good. Practicing for couple of hours broken into a three-part session every day is even better. Finally, it is also important for the singer to drink lots of water while practicing. Think of your voice as a Mercedes engine. You would not drive it without oil to properly lubricate it. The voice functions best when it is well rested, sufficiently hydrated and exercised regularly. Rest days are very important especially if you are singing in a show, a band, a church, synagogue or choir. One day off completely from singing and speaking can be hugely beneficial to the voice if it is being used in a dynamic way everyday. Sleep is your voice's best friend. 6 hours of sleep per night is barely enough for the voice to recover and recuperate from a long day of singing. 7-8 hours of sleep is highly recommended for optimum vocal health. For best results, weekly or bi-weekly lessons are recommended. Many singers will even double up on lessons per week if they are preparing for a role, a tour or a big audition. However, once a week is quite sufficient, especially at the beginning of study. Once you feel comfortable with the exercises and concepts, you can certainly cut back to every other week. I have a 24-hour cancellation policy that works like this. If you do not cancel your lesson within a 24-hour time frame, you will be charged for that lesson. If I cancel your lesson within a 24-hour time frame, your next lesson will be free. Punctuality is always appreciated. However, lesson time is yours, so if you are late, it is your time that is lost. I do understand that unforeseen events can prevent you from being on time. If you are late, as a cause of such an event, I’ll be happy to extend your lesson time into the next hour, provided that there is no one else scheduled at that time. Otherwise, I will try to make up for lost time in future lessons. Please call me as soon as you know that you will be late. Payment for the lesson is due at the time the service is rendered. You can pay with a credit or debit card through Square. If you are paying cash please bring exact change. Students often ask if this technique will make them sound like an Opera singer. My answer to that question is, “only if you want it to.” While the technique is rooted in old world, Italian concepts, I have modified the exercises to fit today's singing styles for pop, rock, musical theater and R&B. Furthermore, having a solid classical foundation in any art form will only help the artist become greater in his/her craft. For example, a person who wants to become a great Jazz dancer will need a good foundation in Ballet. Ballet allows the dancer to develop balance in the body, lengthen their muscles, and develop a strong inner core. Using these classic principles, a Ballet dancer can easily learn a Jazz routine or Hip Hop routine. The same is true, when you study Classical techniques in voice. Many times in my career I have been asked to perform various music styles such as Pop, Rock, Opera, and Country all in the same show. Using a technique that is based on classical principles has allowed my voice to become more versatile and keep it fresh and ringing throughout the entirety of a long performance. Female students are often concerned with the art of belting. In today’s demanding industry, the female voice is often required to belt to the top of her chest voice in one song and then sing in head voice for another song. The concepts and exercises of the technique will allow you to develop a solid chest belt or mixed belt as high as needed in a healthy way that won't feel like belting at all. The voice will remain balanced, which will allow the singer to switch to head voice easily when needed. You will develop a true healthy sound for belting through breath management and vowel alteration. Alcohol has become part of every day life in today’s world. Unfortunately, it wreaks havoc on the vocal cords and the esophagus. Moderation is the key. The more you drink, the less lubricated the vocal cords will become. Drinking heavily will also cause acid reflux which is a real voice killer. Cigarettes of any kind are completely out of the question for singers. Most people know about the harmful effects of smoking to overall health. However, cigarettes are especially hazardous to aspiring singers because they literally burn the thin edges of the vocal cords resulting in a raspy sound, and thereby loose its beauty, resonance and overall quality. If a raspy sound is what you are searching for, consider other healthier ways to achieve it. Smoking will not help you become a good singer by any means. Drugs of the illicit nature further hinder any type of healthy vocal function. A singer should think of himself or herself as a champion athlete. Illicit drugs have no place in this playing field, period.